Lena Dunham (there on the left) is one jive turkey. You can tell by her writing. Jive turkey is a word you can apply to those you speak to who seem to be able to understand and contend with their immediate situation with brilliant awareness. The man outside Benny’s Burritos (aka $3frozenmargaritatown, USA) who tried to sell us his shirt for three dollars used the term in this context. I’m almost positive I’m using it correctly and I’m almost positive Lena Dunham is one of these. Lena wrote, directed, and starred in Tiny Furniture (2010). It follows Aura, the twenty-something, college-skilled, internship-bred type stuck in the funk of existence. She returns home to New York from college and from a sudden split with her boyfriend to live with her mother (played by photographer Laurie Simmons.. her mother) and her sister (played by Grace Dunham, her sister). Aura alternately copes actively and passively with an old environment but new world. It’s a movie with the interpersonal relevance of, say, The Graduate (1967) and the spot-on quick wit of Juno (2007). In this movie, Lena was able to avoid the dradramedic qualities that inhibit the psychological denouement of many the post-graduate film while retaining its sense of poetry and a tasteful amount of angst. Tiny Furniture follows her first 60-minute feature, Creative Nonfiction (2009) and multiple web series on vimeo including the delightful Delusional Downtown Divas. 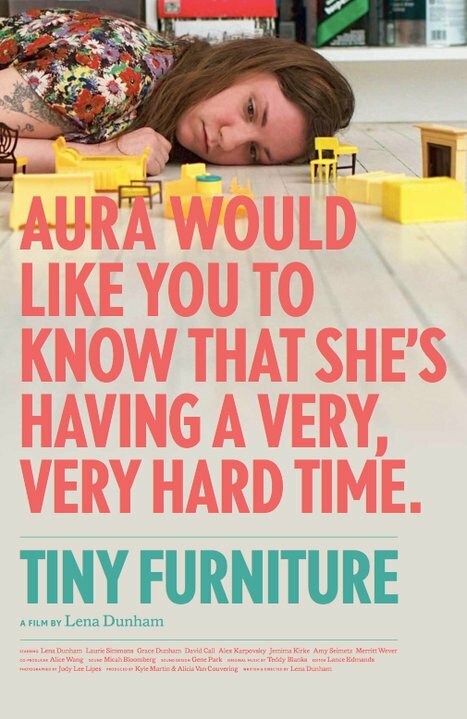 Tiny Furniture won best feature at SXSW. People know about Lena and love her work. E-mail her PR people and tell them to write her a damn Wikipedia page. Listen to the interview to see how Lena and her team were able to crack the balance that cause her work to consistently strike fresh notes with audiences of many ages, sizes, and shapes.